Comm Eye Health Vol. 19 No. 59 2006 pp 42-43. Published online 01 September 2006. Senior Lecturer and Consultant Ophthalmologist, Department of Epidemiology and International Eye Health, Institute of Ophthalmology, Bath Street, London, EC1V 9EL, UK. The purpose of this article is to describe an approach to the most commonly performed surgical treatment for open-angle glaucoma, trabeculectomy. It is important to recognise that the concept of trabeculectomy surgery can be difficult for patients to comprehend in the first place. Their disease is frequently ‘thrust upon them’ by doctors; in other words, they are frequently asymptomatic in the eye that the ophthalmologist is most concerned about. The therapy, at best, can only hope to maintain vision. Vision may well deteriorate as a result of the therapy. These concepts are vital in the consideration of any surgical intervention. Preventive therapy is always more difficult to introduce. This also means the surgeon is all the more challenged to produce the safest possible result. A well-rested surgeon and a calm surgical environment is the start, along with a confident surgical technique. The purpose of trabeculectomy surgery is to create a guarded fistula through which aqueous can drain from the anterior chamber, leading to a steady-state reduced intraocular pressure. If this intervention is appropriate for a patient, drainage surgery has been demonstrated to give long-term intraocular pressure control and visual field preservation. The main complication of this procedure is a failure of drainage due to a scarring response. Other complications include hypotony (low pressure in the eye), infection, and haemorrhage. This article describes each step and lists points for you as a surgeon to consider. It is based on the assumption that the decision to operate is appropriate. What matters is your results. Follow-up of your surgery is vital so you know how successful your surgery is and can take steps to remedy the deficiencies you identify. Rapid reduction of intraocular pressure (IOP) is not good for eyes (decompression retinopathy and suprachoroidal risk). Any puncture of the ocular coats rapidly reduces IOP, so high IOPs should be controlled before entry into the eye. This should be controlled medically and, if normal ocular hypotensive agents do not work, a general anaesthetic with some hyperventilation is best at reducing IOP. If not available, then you have to resort to osmotic agents such as glycerol or mannitol, but these have risks. The operative environment should be optimal: no ocular infection; no infective risk factors (trichiasis, entropion, etc.). If the conjunctiva is inflamed, or there is ocular inflammation (iritis, etc. ), pre-operative steroids may be wise (watching for steroid response in IOP). For conjunctiva, this can be topical; for intraocular inflammation, it may need to include systemic cover. Povidone iodine 5% drops are ideal, unless contra-indicated (allergy, availability, etc.). Allow some to enter the lower fornix. Use some method to remove the eyelashes from your operative field. If a guarded speculum or sticky drape is not available, then a simple piece of plastic can be folded around the lid margin under the speculum. General anaesthetic is usually a luxury but may be required for high IOPs and other high-risk cases. Use whatever local anaesthetic technique you are familiar with to minimise complications and maximise anaesthesia. Retrobulbar, peribulbar and sub-Tenon’s have the limitation of making traction sutures more often necessary and making conjunctival closure more tricky, since the eyeball is pushed forward and less likely to return to upgaze. Towards the end of surgery, the posterior conjunctival edge often has less anaesthesia by these techniques and topical amethocaine is not ideal for this. An alternative is to use subconjunctival lignocaine 2% at the operative site. 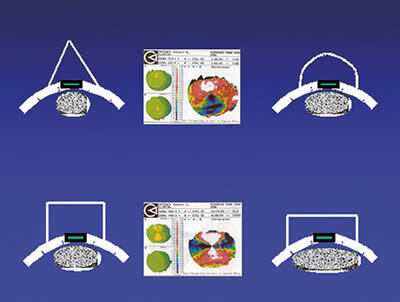 This allows eye movement in downgaze for the main surgery and upgaze for conjunctival closure. In addition, it provides excellent anaesthesia of the conjunctival edge. The disadvantage is that this requires compliance from the patient and there can be some short discomfort during the peripheral iridectomy. A well-placed superior rectus suture is great, but may be prone to subconjunctival haemorrhage, post-operative ptosis, and inadequate placement resulting in conjunctival traction rather than globe traction. A superior corneal traction suture has merits, but ideally should be released before entry into the eye and may get in the way during suturing of the scleral flap, tending to pull the flap back open. One South African doctor has suggested running an inferior corneal traction suture underneath the speculum to achieve downgaze. I have tried this with great success. I personally do not use a traction suture routinely. Fornix-based incisions are now performed by a majority of sub-specialists, mostly on the basis of improved bleb morphology. The Tenon’s attaches about 0.5 mm behind the conjunctiva at the limbus. With your first incision, make a decision to take both Tenon’s and conjunctiva at once, or take the two layers in turn. This varies very much from patient to patient. If you apply a cytotoxic agent, the trend is very much towards large areas more posteriorly, rather than small focal anterior application. Again, this is based on a bleb morphology argument. Be careful to put the cytotoxic agent only where you want it. Multiple small swabs (counted in and out), large dry swabs soaked in cytotoxic in situ, and subconjunctival injection at completion of surgery are all methods employed by different practitioners. Remember that beta-radiation is a simple and effective method, very easily applied once you have a probe. Remember, most bleeding stops of its own accord if a little time is allowed. The purpose of this is to prevent bleeding, nothing else. Be careful not to overdo it. Just mark out focal vessels where you are going to, or have, cut; the whole area does not need annihilation! Perforating veins are better avoided, where possible, by careful planning of the operative site. Triangular, semi-circular, square and oblong are the most frequently used shapes. 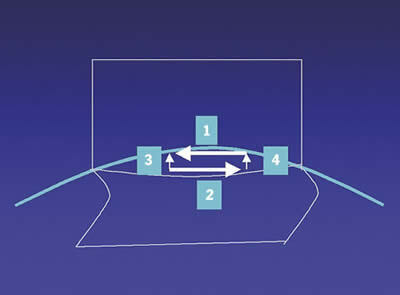 Figure 1 shows the reason for my own preference of oblong scleral flap, namely flow directed posteriorly through the shortest route and easy massage. The main disadvantage of this shape is that it can result in irregular astigmatism that can take up to two years to resolve. If straight dissection is used, pulling hard on the flap at the base, right where dissection is occurring, helps create the surgical plane more easily. If a pocket knife is used, take care to keep the plane of dissection parallel; the most frequent error is a wedge-shaped scleral flap. I recommend an infero-temporally placed paracentesis at this point in the operation, to allow anterior chamber access both at surgery and post-operatively. 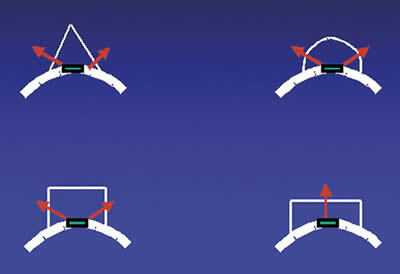 The infero-temporal position is easier to access at the slit lamp. I personally find direct, full-thickness cuts the most rapid and reliable method. The order is illustrated in Figure 2. After cuts 1 and 2, hold the bridge of sclera centrally to enable cuts 3 and 4 to be easily made. If a punch is used, be careful to take the punch to a position 90 degrees to the sclera before punching. This is to ensure a good non-shelved sclerostomy. Go peripheral and cut parallel to the limbus. There is a risk of catching the basal artery of the iris; but better that, and waiting for a little bleeding to stop, than a useless hole in the iris nowhere near where it is required! Minimising the period of uncontrolled hypotony is a good thing. Some use pre-placed sutures for this purpose. 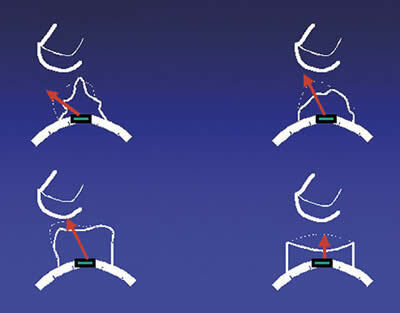 Releasable/adjustable sutures are popular in the UK as a method of easy post-operative manipulation to increase flow. Post-operatively, any IOP, except a low IOP, means you are in control. With too low an IOP you can do nothing other than wait and hope, or take the patient back to theatre to correct surgical error. It is good to secure the conjunctiva back at the limbus with several carefully placed, buried sutures. I routinely use two corner gathering sutures and two central mattress sutures.